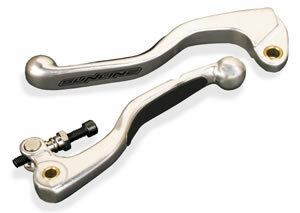 Sunline has a wide variety of levers available including flex levers. Elastomer grip on levers provides ultimate control with custom formed grip pads. Quality machined aluminum alloy allows the lever to bend without breaking. Brass bushings offer smooth operation and precise feel. Sold in pairs. Email your Year, Make, Model of your Bike before ordering for correct part number.